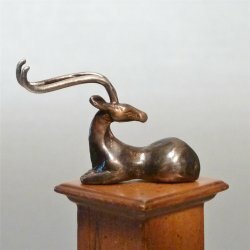 Beautifully Crafted Solid Bronze & Sterling Silver "Antelope" Miniature Sculpture By Noted California Artist Joseph Addotta. Antique Bronze With Sterling Silver Horns. Wood Pedestal Not Included.